Intragastric balloons have been used since 1985 to treat obesity, but an evidence-based systematic review had not been previously performed. The objective of this study is to determine the safety, efficacy, and effectiveness of the most widely used balloon, BioEnterics Intragastric Balloon (BIB®), to treat obesity. Systematic literature review of Medline, Embase, and other information sources from inception to March 2006. The quality of selected studies was assessed. Meta-analysis of weighted mean difference was made using the inverse variance method. We pooled 15 articles (3,608 patients) to estimate BIBs® effectiveness. The estimates for weight lost at balloon removal for BIB® were the following: 14.7 kg, 12.2% of initial weight, 5.7 kg/m2, and 32.1% of excess weight. However, data were scant after balloon removal. 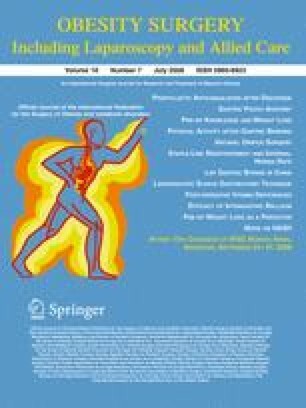 Yet, efficacy at balloon removal was estimated with a meta-analysis of two randomized controlled trials (75 patients) that compared balloon versus placebo, indicating the balloon group lost more weight than the placebo group. These differences in weight lost were 6.7 kg, 1.5% of initial weight, 3.2 kg/m2, and 17.6% of excess weight. Regarding BIB® safety, the majority of complications were mild and the early removal rate was 4.2%. The use of the BIB®, within a multidisciplinary weight management program, is a short-term effective treatment to lose weight, but it is not yet possible to verify its capacity to maintain the weight lost over a long period of time. We thank David Peck for his structural review of this manuscript. Oxford Centre for Evidence-based Medicine. Quality filters [On line]. Web of the centre for evidence-based medicine, 23-10-2006. http://www.cebm.net/levels_of_evidence.asp.